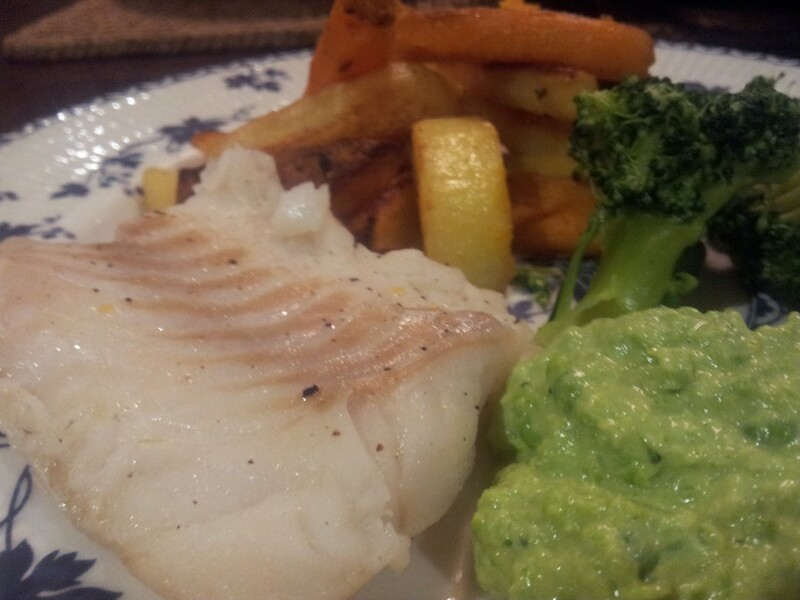 Fish and chips must be one of the most glorious dishes on the English menu. Dripping in salt and fat like congestive heart failure on a plate, it’s one of the few take aways that requires a coronary stent after consumption. Whilst I have serious passion for the occasional battered treat (not a euphemism), recently I’ve been experimenting with homemade alternatives. My latest concoction sounds fancy but is ridiculously easy to prepare. And whilst it’s missing that saturated fat overload you get from a proper chippy, it does have the benefit of containing about a tenth of the calories. 2.) Melt a large knob of butter into a small bowl and stir in a tablespoon of olive oil. 3.) 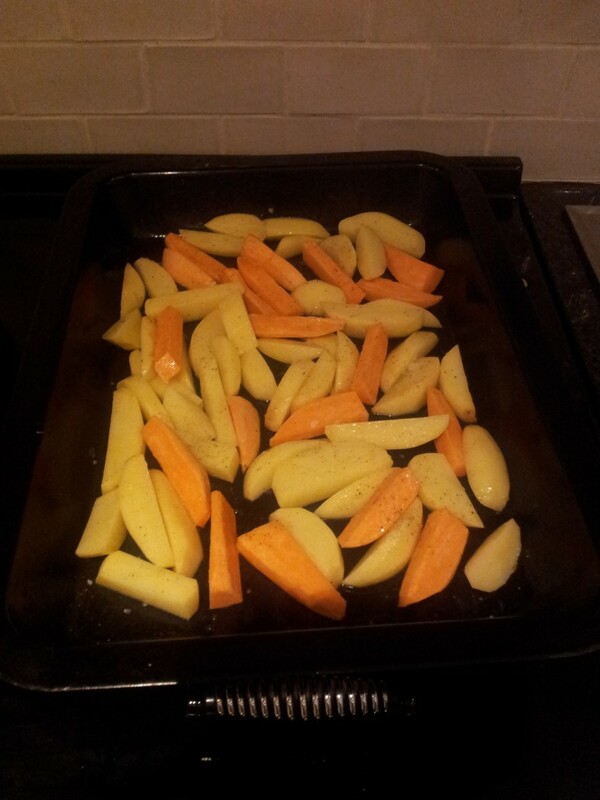 Arrange your chips in a baking tray (making sure they’re not overlapping) and pour your oil and butter mix over the top. Toss your potatoes until they’re all fully coated in the mixture and add sea salt and cracked black pepper. (Make up a little more oil/butter if it looks too dry.) Pop them in the oven on 190 degrees C. 4.) After 20 minutes turn your potatoes and boil some water for the peas. 5.) 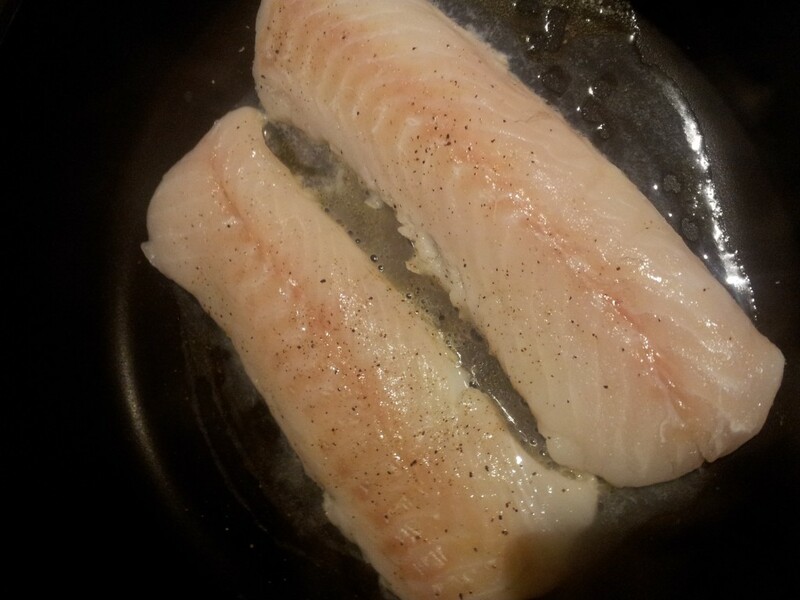 Put a small knob of butter in the bottom of a frying pan ready to cook the fish. 6.) Boil the peas in the water (lightly salted if you like) before you season your fish and fry on a low heat. 7.) When the peas are ready drain them and add a tablespoon of mayonnaise. Grab your electric mixture and whizz (for lack of a technical term) until it reaches a smooth consistency. Add drops of lemon juice to your own taste. (I used about six or seven drops.) if you like you can add an extra tablespoon of mayonnaise for a creamier texture. 8.) 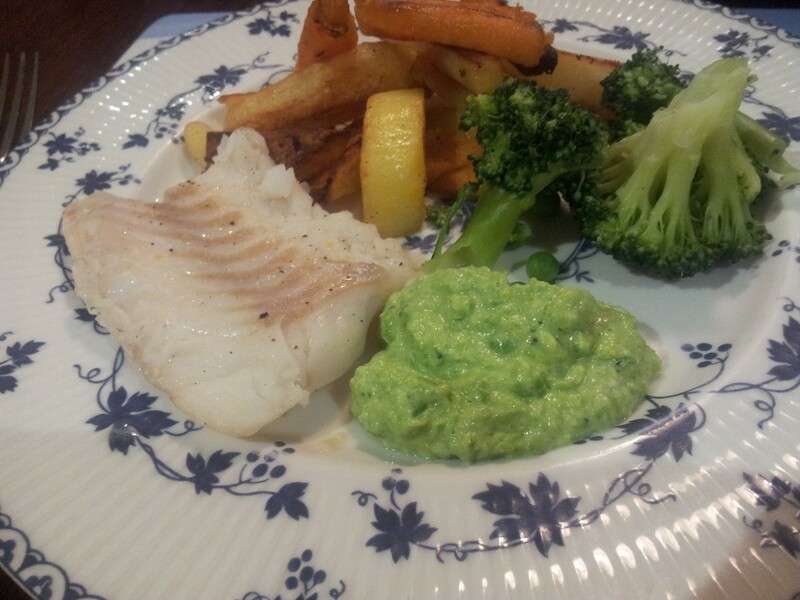 When the fish is cooked through and flaky it’s ready to serve with your chips and pea mayonnaise. If you’re feeling adventurous chuck in some extra green veg to ward off scurvy.